There are so many wonderful things about spring, and dying Ostara eggs is one of my absolute favorites. I am not shy about my religion, being a Wiccan woman and proud of it is honestly one of the favorite things about myself. I know it sounds ridiculous, but I'm happy to be a Wiccan. I am happy to call myself Witch. While Wicca itself is a modernization of old Pagan values and practices, I still see it as an ancient and beautiful religion with so many fun ways to practice it in the modern day. Ostara is my favorite Sabbat, and dyeing eggs is my favorite activity, which I look forward to doing all year long. With so many creative ideas going all around Pinterest, it's easy to get caught up in all of it! Here's the thing about Pinterest, though: It's all insanity. I've gone on quite a few Pinterest kicks in my day, and most of the pictures from my results have been burned since they were too fail-tastic to show anyone. But do you know what else is fail-tastic? Chemicals, and too much of them. We are becoming more and more aware of the food we eat and the chemical crap that goes into it, and the body is a temple, so you must worship at it accordingly. Now, if you want your temple to be full of chemicals and GMOs and junk food, that is completely fine. It is your body. It is your temple. I honestly don't mind getting a little crap in my system. Being someone who struggled with body image and an eating disorder before(both first and second hand)I have learned to listen to my body. If my body wants some organic grapes, I feed her that. If my body wants Cheetoes and ranch dressing, I feed her that. That being said, I realize that I'm getting older, and that the world is changing...so I should learn to change and adapt with it. Why not start with my favorite things for my favorite sabbat: the Ostara Egg. 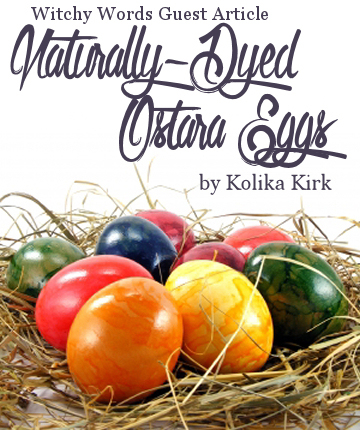 So here is a super-quick guide to dyeing Ostara eggs in a natural way! These recipes are done using what is known as the boiling method, which is my preferred method. You basically take your "dye" ingredients, whatever they may be, and combine them with water and a nice teaspoon of white vinegar, then boil the eggs in the liquid for 14 minutes and let set. Basically, just boil everything in the biggest pot you've got, then turn off the heat and cover. This will not only result in perfectly cooked eggs, but a beautiful bright hue. Here's the thing about this method: it takes forever for the color to set. The amounts of the dye ingredients are sort of whatever you like. Once it boils, you can add more color, if you like, and let it steep. Remember that the longer that you let it steep, the more brilliant the color will appear. The one advantage to artificial dyes is that they are fast. Only a short 8 minutes and you have beautiful eggs, all brightly colored! For the best results on your natural dyes, it's honestly best to let them sit overnight in the liquid. There are disadvantages to this in the practical sense, especially if you have small children who just can't wait to see their beautiful creations, but your patience will be rewarded. However! This does not mean you should be discouraged, especially because you have so much creative room. Did you know that you can "print" on your eggs using leaves and flowers that you find in your garden? My garden isn't really in bloom, yet, but this visual tutorial can be used as a guide. This is a method that can be used with gauze, mesh, cheesecloth...but, honestly, I've found that a doubled-up coffee filter can work just as well in a pinch The red color seen here is from boiled beets. Instead of wasting beets, just peel the beets that you were going to roast or eat anyway and use that leftover peel in the water. Beets yield a gorgeous color, and stain everything they touch, so they're ideal. Plus, beets are tasty. You can use red or golden beets for this application, both of which give lovely colors. Like I said, the longer you let it sit, the better. But please keep in mind that too much vinegar will eventually soften your egg shell...which is both kinda cool and really gross. Exercise caution! How can this kind of thing be applied to your modern Witch? Simple! Take herbs and leaves that go with your own desires and wrap them in the eggs. Letting the eggs sit overnight will let the energies mature, penetrate your "seed" which will be an uber-powerful spell bomb in the morning! Traditionally, this is the part where "hiding" the eggs come into play. You hide or bury these eggs in your garden or outside somewhere, with pictures of your wishes drawn on them, for the Fae to find. They take your wishes to the Goddess, and she grants it. Or something. There are so many versions of this story and how hiding eggs came to be. I remember the stories that my own High Priestess would tell about how the eggs are seeds, and we hide them to plant them. We sow the seeds of our wishes, our desires, and nurture them throughout the seasons, which help them come to fruition. In my mind, this is all the more reason we should use natural dyes. After all, if you're going to end up planting your "seed" in the ground, in the garden, you may as well use natural stuff. 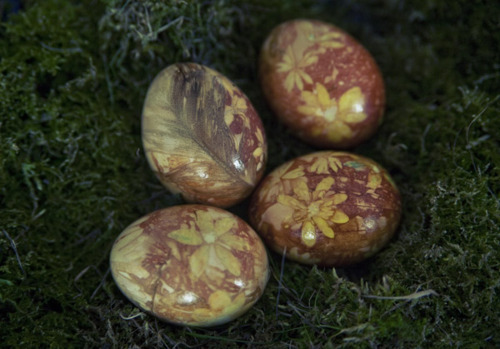 The most-beautiful natural egg dye job is this beauty, which is made from onion skins and flowers. I can just imagine the wonderful scavenger hunt you'll go on trying to find these flowers, can't you? They just look terrific. You can find the full visual tutorial here. 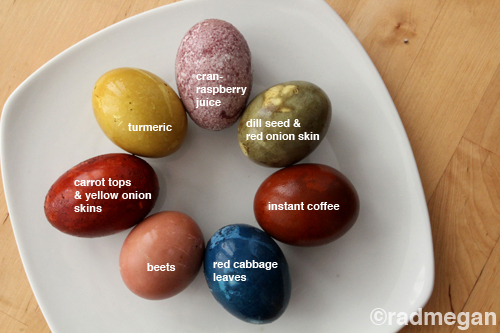 Like I said, there are advantages and troubles to dyeing eggs in the natural way. Advantage: no extra chemicals in something you'll probably use for devilled eggs, if you don't intend to plant them or use them for a ritual. Advantage: They're gorgeous and fun! Disadvantage: The ingredients for certain dyes (blueberries, beets, turmeric, saffron, wine, etc) can get crazy expensive, which is no good if you're on a budget. Seriously, do you know how much blueberries cost? Just to not eat? Advantage: Kids can safely enjoy without any risk of chemical reactions, as can your more delicate friends. Advantage: You'll have one more fun thing to put on your Pinterest! Disadvantage: There's a really big chance that it won't turn out like the pictures, so you might be setting yourself up for disappointment, when you could have just bought dyes. Speaking of buying dyes, you can purchase powdered dyes off the internet for such au naturale dye jobs...but what's the fun in that? Go ahead and try these out. You're a powerful being: do the thing. Happy eating and Happy Ostara! 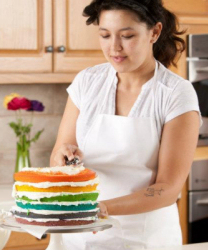 Along with being the Bookkeeper for Circle of Fountains and a dedicated Wiccan, Kolika is Trezo Mare's pastry chef and a member of the ACF. She also volunteers with Young Women on the Move. You can find her blog and read more about her adventures at Wanna B Gourmande and like her Facebook page here. Do you have an Ostara altar in a cup like you did for Imbolc? I don't, but it's definitely an inspiring idea. I may see if I can't come up with something. Thank you so much for reading! Compliments to Kolika! I'm sure she appreciates it!